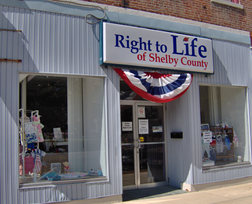 RTL-SC operates a Thrift Shop/Clothing Center at 102 East Poplar, at the corner of Ohio Avenue, on the court square in downtown Sidney, Ohio. The shop is open to the public and all items are offered for a garage-sale-type donation. In addition, we offer free items for those demonstrating need. All items are donated and gently used. We offer children's clothing from infant up to child size 16. We also offer maternity clothes and other baby items. We do not accept adult clothing (other than maternity clothes), adult furniture, badly stained, worn, or broken items. Donations can be dropped off during our hours of operation: 10am to 4pm, Tuesday through Friday; during the summer Farmer's Market, we are open on Saturdays from 9am to 12 noon. We are closed Mondays, weekends, and holidays. The office phone number is 937-498-1812. In the winter, if schools are closed due to bad weather, we are generally closed as well. Please call ahead.